Tom Petty Birthday Bash, Live at the Foothills! It’s almost here! 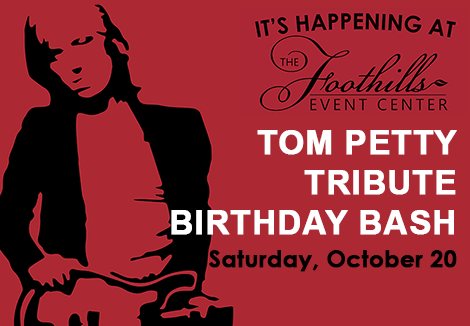 The Tom Petty Birthday Bash, Saturday October 20 at the Foothills! Our live concert series It’s Happening at The Foothills will bring the band Petty Luv to the stage to celebrate the legacy of Tom Petty’s music. We invite you all to come out and raise a celebratory pint on what would be Petty’s 68th birthday. Petty Luv is dedicated to keeping Tom Petty’s music alive, and performs hits like “Mary Jane’s Last Dance,” “Don’t Do Me Like That,” and “I Won’t Back Down.” Find out more about Nevada County band Petty Luv here. We’ll also welcome Grammy Award winner Michael Ward to the Foothills stage. Ward is the former guitarist of The Wallflowers, who were awarded a Grammy for Best Performance by a Duo or Group for their song, “One Headlight.” Ward is a big Tom Petty fan whose accolades and credentials run deep. Over the years, he’s worked with several other well-known artists such as Ben Harper and the Innocent Criminals, Gogol Bordello, Benmont Tench, John Hiatt, Tiny Buddies (to name a few) and to date has over 30 albums to his credit. Here’s a fun connection to Petty: the slide guitar on The Wallflowers song “6th Avenue Heartache” is played by Mike Campbell from Tom Petty’s band. The Tom Petty Tribute Birthday Bash is the first of its kind in our area! Everyone is welcome to celebrate the life and legacy of Tom Petty. Grab your tickets soon. We encourage you to arrive early, and bring a friend or two! The Foothills Event Center is excited to welcome Petty Luv to our stage for an epic Tom Petty Birthday Bash! We hope you can join us in celebrating the unforgettable music of Tom Petty on his birthday. We’ll have delicious bites available from Horn of the Bull Taqueria’s food truck. Tickets are $15 in advance, and $20 at the door. Doors open at 6:30 pm and the music starts at 7:30. We’re so excited to celebrate with you!